I asked Matt Wisnioski to share something with our readers about the history of technological change and innovation in celebration of the release of his book, Engineers for Change. I’m extraordinarily happy to offer this guest post on the unexpectedly fascinating history of a modern slogan. Change or die! Source: “Change or Die!” Electronic Design 18, no. 13 (1970), 64. A sure sign that an idiom has become a meme is when journalists attract page clicks by speculating on what it would mean to take it literally. That was the opening conceit of Alan Deutschman’s 2005 article “Change or Die” for the magazine Fast Company. Summarizing IBM’s Global Innovation Outlook conference, where “the most farsighted thinkers from around the world” addressed seemingly intractable global problems, he argued that science has shown that in only one time out of nine, when faced with preventable conditions like heart attacks, are people able to change. The lesson translates across all realms of human activity. Confronted with radical changes from outside their walls, businesses find themselves unable to adapt. If they hope to thrive, corporate leaders need a “strategy for continuous mental rejuvenation and new learning,” he quotes neuroscientist and entrepreneur Michael Merzenich. In his article and subsequent monograph of the same title, Deutschman had his finger on a pulse that he simultaneously helped create. A Google search of change or die combined with its parent term innovation generates over two million hits, including “change management” blogs, studies of the cable television industry, and policy analyses of biomedical research. Few aphorisms so pithily capture the ethos of contemporary technoscience. “Change or die” evokes the making of new technologies in an environment of rapid disruption. Entrepreneurial, goal-oriented research upends the administrative and financial structures of entire industries. Simultaneous advances in a diverse range of fields intersect to produce research opportunities and new markets. Hybrid teams of experts coalesce and dissolve across disciplinary, institutional, and national boundaries. The result is a chaotic engine of accelerating progress that brings great reward to the survivors. It is an expression of Darwinian logic that applies to economics, to knowledge making, and, most of all, to the knowledge workers charged with living in a state of creative flow. Like “innovation” itself, “change or die” is a strikingly novel expression. One finds the smallest trickle of precursors. The phrase makes an appearance in a 1710 sermon that admonishes ministers to have fortitude when encountering the “proudest Worms on earth.” It again surfaces in a handful of 19th century poems and songs. The Massachusetts anti-slavery politician Charles Sumner and the adventure novelist Zane Grey also hit upon the idiom. In his 1939 book Patterns of Survival, the geologist John Hodgdon Bradley was one of the first to give “change or die” an evolutionary interpretation. In these earlier uses “change or die” was neither admonition nor binary choice. Curiously, in 1961, it evolved into an axiom of sociotechnical Darwinianism in an editorial titled “Change or Die” in Voice, the magazine of the Cement, Lime, Gypsum, and Allied Workers which argued that “reactionary organizations” such as the Chamber of Commerce had been unable to adapt to the industrial economy and operated with an obsolete mindset suited to the “bygone era” of King George III. But, its widespread manifestation as a Heraclitian axiom is due to an organized cadre of entrepreneurs in the 1960s and early 1970s. In 1961, William Maass, a charismatic vice-president at Conover-Mast (publisher of Boating Industry and Volume Feeding Management) had a vision for a “new kind of publication” designed to help scientists, engineers, and research managers keep pace with the technological age. According to Maass, the “consumption of fundamental science by technology” had accelerated such that time from “idea” to “utilization” was reduced from decades to weeks, obliterating distinctions between scientists and engineers. Supported entirely by advertising, his magazine International Science and Technology was given away for free to 120,000 of the world’s top technoscientific practitioners. 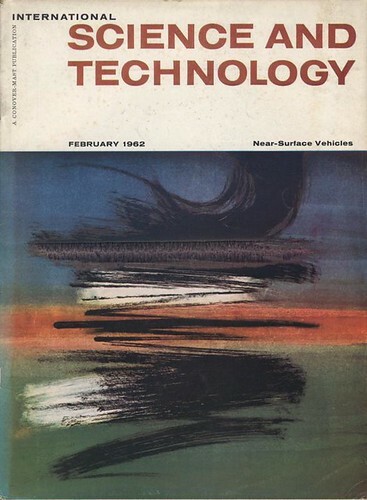 Produced by leading science journalists, including senior editor Robert Colborn—Dartmouth engineering grad, published novelist, and former editor of Business Week—and an august advisory board, it carried interviews with Nobel Prize winners, technical executives at Bell Labs, and science administrators from France, Pakistan, and the Soviet Union. It also offered intimations of an emerging ideology of innovation. In November 1964, IST launched an advertising campaign in business magazines and newspapers, as well a film oriented to corporate marketing divisions, with the slogan “Change or Die!” literally written on a wall. Maass assured his scientific readership that they were the drivers of technical advance, that it was the marketing and business side that did not yet understand the epochal revolution in which they were living, and that they needed to prepare themselves to adjust. In 1970, the Innovation Group recycled Change or Die! as a philosophy for everyone. In the advertisement excerpted above, which ran in major business and technical journals, they presented their magazine’s core functions. 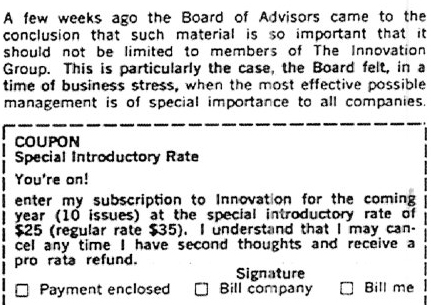 Innovation first provided technoscientific practitioners an encompassing explanatory frame, “a unique picture of what is happening to your work environment.” But it then promised to equip readers with an introduction to “the most powerful of the new management techniques,” that included systems thinking and technological forecasting, so that they might impose order on an “ever-changing environment.” These were to be learned in the microelectronics industry through interviews with Robert Noyce and Gordon Moore, in the avant-garde of new media with primers on time-sharing, in accounts of struggles to adapt by traditional automakers, and in innovative solutions to environmental pollution that engaged business as much as government. In its second dip into the advertising well, however, the Innovation Group signaled its own difficulties of adaptation. The ad represented a major change in strategy from speaking to rarified elites to a broader audience of middle managers. Aesthetically, the ad—with its the coupon, dramatic price drop, abundance of explanatory text, and overwrought justification for the change in business plan, was a pale reflection of the avant-garde quality of Innovation itself. Behind the scenes, Innovation would experience multiple tragedies. In 1970, Colborn died of cancer. Then Morton was found murdered in the charred remains of his car, the victim of a violent mugging. 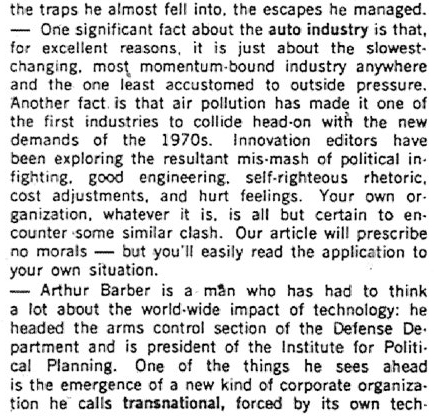 In 1972, Innovation unceremoniously was absorbed by the economics journal Business and Society Review, another young publication that bore little in common with it stylistically or ideologically. Staff dispersed to do public relations for companies such as Xerox, corporate consulting, and freelance science writing. One need “prescribe no morals” but may “easily read the application” to see that when the Innovation Group faced its own advice, for reasons beyond its control, it did both. Matthew Wisnioski is assistant professor of Science and Technology in Society at Virginia Tech. He is the author of Engineers for Change: Competing Visions of Technology in 1960s America, the first book in the MIT Press’ new Engineering Studies series. He is at work on a new book titled Inventing Innovators that explores the rise of innovation discourses and design methods in post-WWII technoscientific identity. This entry was posted in Alan Deutschman, Change or Die, HoTeES, HoTMEsS, Innovation, International Science and Technology, Matthew Wisnioski, William Maass on December 11, 2012 by americanscience.